This morning, Dave snorkeled under the boat to check the through hulls and zincs. The through hulls are pipes or tubes that go from the inside of the boat to the hull for any water that need to be drained or brought into the boat. Over time, barnacles attach when they are small, but they grow big enough to stop the flow of water. So Dave takes a long screw driver and cleans them out occasionally. Everything runs much smoother. 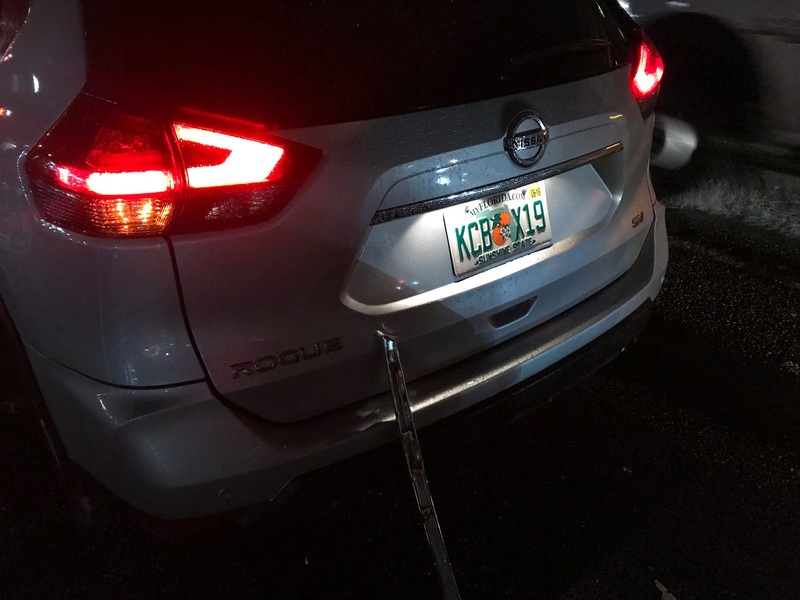 There was poor visibility, so he will change the zincs in the Bahamas. The prop looked great, no barnacles. He smeared Lanacote on it a long time ago, and it works. We were able to move to the marina just a mile away about noon. When Dave raises the anchor, he has to remove the snubber first. That is a rope from both sides of the bow that relieves the stress off the chain when you bounce in the waves. It was under our boat and actually wrapped around the keel. We went several directions and finally had to go in a circle to unwrap it. We were anchored in a current for 36 hours, so changed directions 6 times. The marina had a strong current, but we were able to tie up on a T dock, on the end. That way we didn’t have to maneuver into a slip, which are not much wider than our boat. After we checked in, we had lunch at their Tiki Bar right on the water. We were ready for a beer or tropical drink, but we still had to a long day ahead of us. 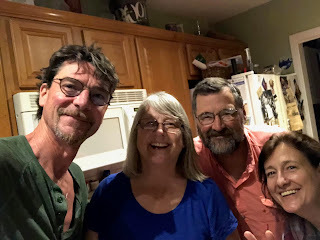 We decided just a couple weeks ago to have Dave’s mom sail over to the Bahamas with us. Alice spent her 87th birthday with us on the boat in Rhode Island last summer. She did great getting in and out and off and on the boat. After we asked her to join us, we realized she hadn’t been on the boat while it was moving for about 4 years. After discussing it with her again, she said she didn’t care if she broke anything, she still wanted to go. We cleaned up and headed to Enterprise about 3:00 to pick up a car. Alice was scheduled to arrive at 7:00pm in Orlando, an hour and 40 minutes away. We made arrangements to meet with Kate and Brian Sweeney before she landed. We met them through Ski for Light in SD about 25 years ago. We had a great visit at their house on a lake east of downtown Orlando. Alice’s flight was delayed until 8:20. We were about 5 minutes from the airport around 8:00 and were rear ended while we were stopped to turn left. It wasn’t a hard hit and no one was hurt. Dave called 911. They dispatched him to the highway patrol, since we were on a state road, I guess. They recommended we both move to a nearby gas station and wait for them there. We only noticed a piece of plastic that was broken off the bumper. But since we use the insurance through our credit card, we needed all the paperwork. The other car was driven by a young guy. His mother and brother were with him. He didn’t have his headlights on. He had just bought the van for $200. He had borrowed plates on it. And he was getting insurance and plates the next day. Didn’t look too promising. I found her near the baggage claim looking pretty tired. Of course, by the time she arrived there, about an hour after landing, the remaining bags had been picked up. Someone from Sun Country had just arrived (Dave arranged that). I went with him to get her bag. Good thing because it was quite a walk. After returning with her bag, we headed to the food court. Alice was hungry, but we didn’t have transportation to go anywhere. 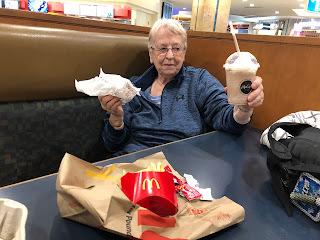 We had to walk a ways to find food, but she had a “Happy Meal” from McDonald's. We headed back to the baggage claim to have the airport shuttle pick us up. I called and they said they had to meet us at a different terminal. They are only allowed to pick up people at one door. Well, there was no way Alice was going to make it another step. So I called Lyft again to take us to the Holiday Inn. We were finally in bed by 12:00 midnight, but no Dave. Back to his story. We were told by Enterprise that we needed the accident report from the highway patrol. Dave had called the highway patrol a couple times to try to get an ETA. They had told him he could submit his own report online. At 1:00 am, he was finally told that there had been 2 fatalities on the highways that night and they still didn’t know when they would arrive. He checked with Enterprise again. They said under those circumstances, they would use his online report and it was ok to leave the scene of the accident. Dave had a pictures of the cars, and of the other guys driver’s license. And he had his mom’s name and number. She said to call her tomorrow and she will give him the insurance information. I doubt they will cover anything from the day before it was purchased, but we’ll take it. So Dave arrived at 1:30am. I don’t think either Alice or I had been able to sleep worrying about him. What a day! !